You guys know when I try a new recipe I just have to share! I have been in a no meat, no bread challenge for a week. 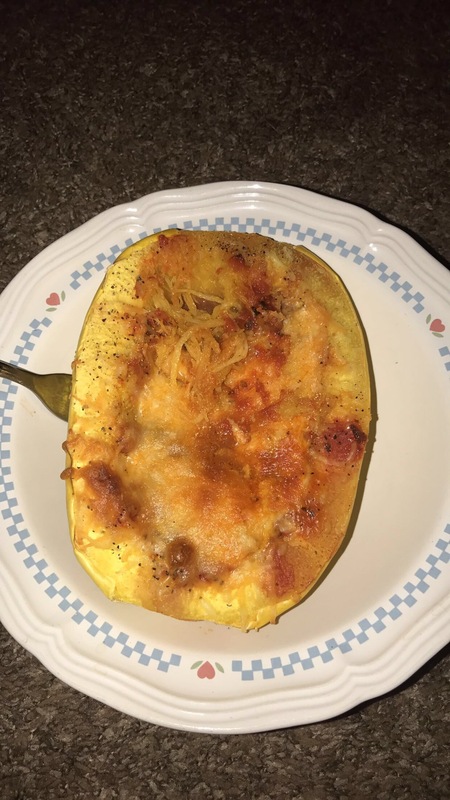 I was crazing some pasta, so I tried this spaghetti squash recipe I found on Pinterest. Basic right? After cutting the squash in half, I put it in the microwave in a bowl with a little water for 10 minutes. This was done to cut down on oven time. While that was in the microwave, I sautéed the mushrooms in olive oil on the stove for a few minutes. Place the squash on a cookie sheet and sprinkle the garlic powder and pepper (or other seasonings you like) split the amount of mushrooms between the two halves and then cover with spaghetti sauce. Top with cheese and slide in the oven. Let it cook for 25-30 minutes.